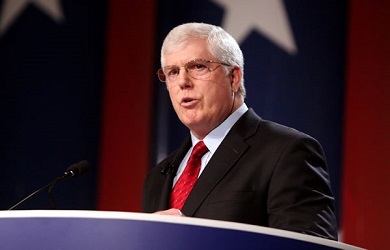 Mat Staver, the head of the anti-LGBTQ legal group Liberty Counsel, returned to his favorite analogy last week, saying that the Southern Poverty Law Center’s labeling of his group as an anti-gay hate group is part of a persecution of Christians in America reminiscent of the treatment of Jews in Nazi Germany, and linked the removal of Confederate monuments throughout the country to a larger “civil war against our values” happening in the U.S.
Several years ago, the SPLC started adding anti-gay groups like Liberty Counsel to its lists of hate groups, noting that its decision to label these groups as hate groups was generally “based on their propagation of known falsehoods” about LGBTQ people and specifying that “[v]iewing homosexuality as unbiblical does not qualify organizations for listing as hate groups.” However, this has not stopped many of the anti-LGBTQ groups whom the SPLC has listed from claiming that they are merely on the list because of an opposition to marriage equality. When the host of the program, Jim Schneider, asked how far the nation would let this sort of thing go, Staver issued a dire warning. Later in the interview, Staver lamented the “coarsening of discourse and a lack of morals and integrity” in American political debates, which he chalked up to “the erosion of our Judeo-Christian values” and what he claimed is intolerance of dissent. He added that “if we want to start taking down our history, our monuments, because certain people were not at the same level that we want them to be today” the only monuments that would remain would be those of Jesus Christ.